Consumers see with their hands as much as they do with their eyes. Ever notice someone shop for a new car? How they carefully run their hand across a fender or take hold of the steering wheel? For a prospective buyer, touching or holding your product is essential for them to learn about it, be comfortable with it, and make a buying decision. They want to determine if it's heavy or light, get a sense of its operation, its features, complexity, texture, sturdiness or delicacy, etc., and judge their overall satisfaction with it. No video, augmented reality, image, or verbal description can replace that instinctive human need to get personal, tactile feedback - yet there's a way to make the experience much better: LiftOff™. 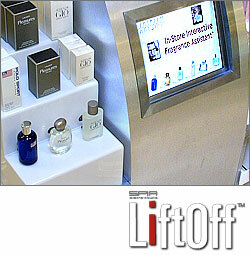 LiftOff™ takes a shopper's instinct to touch and enhances it by providing rich, interactive product information, via any form of media or interactive experiential tool. When someone picks up a LiftOff™ enabled item, they engage much more than a simple "trigger" to play a message, they get virtual guidance with accurate information, sales assistance, a personalized shopping experience, and gratification. LiftOff™ is a complete interactive marketing system that builds desire and adds credibility to your products through user participation. It can measure a shoppers "path" exploring multiple items and provide sales prospecting and qualifying, as well as detailed metrics - all in real-time. LiftOff™ can launch and be part of a consumer curated shopping adventure that customers truly appreciate.